Who knew that leaving your balcony door open would set off your cabin’s smoke detector? But that’s what my travel companion and I learned about 10 minutes after boarding Royal Caribbean’s newly renovated and lengthened ship, the Enchantment of the Seas. We’d stepped out to explore our balcony and take in the view of Boston Harbor when the smoke detector kicked in with a high-pitched beeping that sent us into the hallway, wondering if we had to evacuate the ship. A savvy (and probably bemused) crew member explained that we should keep the door to the balcony shut to prevent further mishaps. And that’s when I realized that there are some lessons about getting the most out of your cruise vacation that you can only learn from having cruised before. As I was recently invited to spend some time on the Enchantment and Norwegian’s brand-new ship, the Norwegian Jewel, I thought I’d share some of the more valuable lessons I learned from my time on board these mainstream cruise ships, so you’ll be one step ahead on your next vacation at sea. I have never worn so many outfits in one day as I did on these cruises. I’d start off in casual summer clothes, then change into a bathing suit and cover-up, then switch to workout clothes, and finish the day in nicer evening wear. I tried to brave the Royal Caribbean cruise with only one pair of sandals; that was a big mistake. I couldn’t try the bungee trampoline because I had no socks, and as I didn’t bring flip-flops, my sandals got soaked on the wet and squishy flooring of the pool deck. Given the tight quarters in many cruise cabins, it’s tempting (and smart) to pack light. Just be sure to pack the right clothes for the activities you plan on doing. In the name of journalistic enquiry, I felt that I must try out the spa services on each ship and report back. On both trips, I boarded the ship, dropped my bags in my cabin, and headed straight to the spa. Both times, the spa had extremely limited manicure appointments. I learned later that the Norwegian Jewel only has one dedicated manicurist for a ship that holds thousands (they’re planning to add a second). When I swung by the gym, I also saw that the pilates and yoga classes were filling up quickly. If you’re interested in booking an appointment, taking a class, or even making a reservation at a specialty restaurant, I suggest you sign up first thing after you board so you’ll get a spot before they’re all gone. Norwegian and Royal Caribbean each take different approaches to dining. 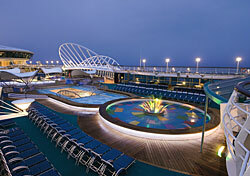 Royal Caribbean offers the traditional two seatings in the main dining room and then a buffet by the pool deck. Norwegian offers a choice of up to 10 restaurants, but some have surcharges or are reservation-only. In my experience, the buffets were nothing special, but they certainly were convenient when you don’t want to spend two hours eating lunch. On the Jewel it was fun to choose between the many restaurants, but I heard many stories about waits of several hours to get into some of the more popular eateries. I did enjoy my meals in the main dining rooms of both ships, and both served excellent vegetarian and light-fare options. I was also impressed with the amount of food I could order in the wee hours of the morning on the Enchantment and the Jewel. However, most of the options consisted of burgers, pizza, or french fries, and after eating fish ‘n’ chips at 2:00 a.m., then going straight to bed, I don’t think I can recommend the experience. My companion on the Enchantment remarked that there’s hardly an hour of day when you can’t get something to eat on a cruise ship. Between the midnight buffets, 24-hour room service, and between-meal snacks, you could accomplish some marathon dining onboard. If you’re not willing to spend your precious cruise time in the gym working off dinner, I suggest taking the stairs. The onboard elevators can be slow, so it’s faster and healthier to walk a few flights between decks. You’ll also find that walking around the ship is pretty good exercise and entertainment; three times around the ship is a mile. Both the Jewel and the Enchantment have promenade decks where you can walk the circumference of the ship outside in the fresh air. When they say mega-ships, they’re not kidding. Now, I have a good sense of direction, but on the cruise ships, I had trouble getting my bearings. So I learned a few tricks to help me out. Both Norwegian and Royal Caribbean offer ship diagrams near elevator banks. If you’re lost, find one of these handy maps and it’ll put you on the right track. On the Jewel, the carpeting along the halls by the staterooms is decorated with fish. All the fish are swimming in the same direction as the ship. So if you’re walking with the fish, you’re heading toward the front of the ship (fore) and if you’re walking against the fish, you’re heading toward the back of the ship (aft). Plain purple carpeting marks the elevator banks. If you have trouble walking long distances, I would encourage you to book a cabin near an elevator. Cruise lines market themselves as all-inclusive experiences, but you wouldn’t believe how many chances you have to spend money onboard. From spa treatments to pina coladas, professional photography, art auctions, specialty coffee and ice cream, and souvenirs, you can rack up a pretty hefty bill in no time. No cash is allowed so it’s easy to charge something to your room and forget about it. Try to pay attention to your expenditure so you’re not shocked when you receive a several-page itemized bill in your cabin on the last day. After all, you are on vacation. I forked over more money on nail treatments than I ever would have at home. For the record, I preferred the manicure I got on the Enchantment to the one I got on the Jewel. However, as Norwegian’s prices were cheaper, I also got a pedicure. The relaxation and enjoyment I got from sitting in a comfy chair, gazing out at the ocean while someone massaged my feet definitely added something extra to my mini-vacation. So, if you want to treat yourself, go right ahead. Just choose wisely where you want to spend your money and where you’ll need to save it. A mainstream cruise is anything but no-frills sailing. From champagne bars to fine art displays, high-quality dining, and exotic spa treatments, you can easily find ways to pamper yourself. Royal Caribbean even added an entirely new midsection to the Enchantment so guests could enjoy a new specialty restaurant, a Latin music lounge, and expanded salon. With mainstream cruising, you can choose to pay less for an inside cabin and spend more time taking advantage of onboard amenities. Or, you can pony up for a garden villa with a private courtyard on the Jewel or a fancy suite with a grand piano in the living room on the Enchantment, and still participate in all a mega-ship has to offer. To me, luxury is an escape from my computer, time spent outdoors, and plenty of chocolate, and both ships rose to the occasion to indulge me in all three areas. Getting home from the New York terminal was a disaster. I had a voucher for an airport transfer, but I had no idea what method of transportation was taking me to LaGuardia or what time the shuttle would depart, and I couldn’t find anyone to ask. Plus, the cruise line’s travel department had booked me on a 7:00 p.m. flight. As the buses from the pier departed in the morning, I spent six hours at LaGuardia before I snagged a standby seat on an earlier flight back home. I cannot recommend spending that much time in any airport; I suggest that you make your travel arrangements carefully and double check them when you get your final documents. Arriving a day early or departing a day late gives you breathing room in case of flight delays, and a little extra time to explore your port city while having a place to leave your bags. And always check that you know where and when to find your airport transfers. If you’re choosing between these two lines for your next vacation, I would say the choice ultimately comes down to eating versus playing. Norwegian is for the foodies because its ships are practically floating smorgasbords. If you want to dine at a different restaurant every night (and morning and midday and late afternoon and…), the Jewel will certainly give you those opportunities. You may have to plan your meal times in advance, but you’ll never be bored with the food choices. If a never-ending array of activities is more important to you, I’d suggest Royal Caribbean. The fleet offers rock-climbing walls, ice skating rinks, bungee trampolines, splash pools, and (coming soon) onboard surfing and body-boarding. With so many activities, you might not want to get off the ship when it docks in port. I’m always on the lookout for a good deal, and I found a few on these ships. On the Enchantment, the prize for best bargain goes to the free pool deck activities, such as rock climbing and the bungee trampoline. That’s a lot of fun for no money down. On the Jewel, I’d vote for the individual karaoke rooms. For $10 per person, you and your friends can release your inner rock stars for an hour (without embarrassing yourselves in front of the other guests) and receive unlimited drinks. On a ship with $5 beers, that’s an amazing deal.